Sure, Valentine’s Day is geared towards those in love with their significant other, but I’d like to extend the invitation to those of you who might be spending the day alone, to friends, to family. It’s still a day anyone can enjoy. Plus, there’s always the excuse to pig out on chocolate! Check out Jayden’s credits HERE! Hand Tattoo :: [Sleepy Bozer] – U Mad Bro? (Black) NEW! Shirt :: DOZZE – Untucked Striped Shirt (Black/Red) NEW! Tattoo :: [Sleepy Bozer] – U Mad Bro? (Black) NEW! Ear Add-Ons :: F.owl – Leaf Ear Cuff – ANTHRAZIT NEW! Sideburns :: Unorthodox – Flex Burns w/ Chin Hair NEW! 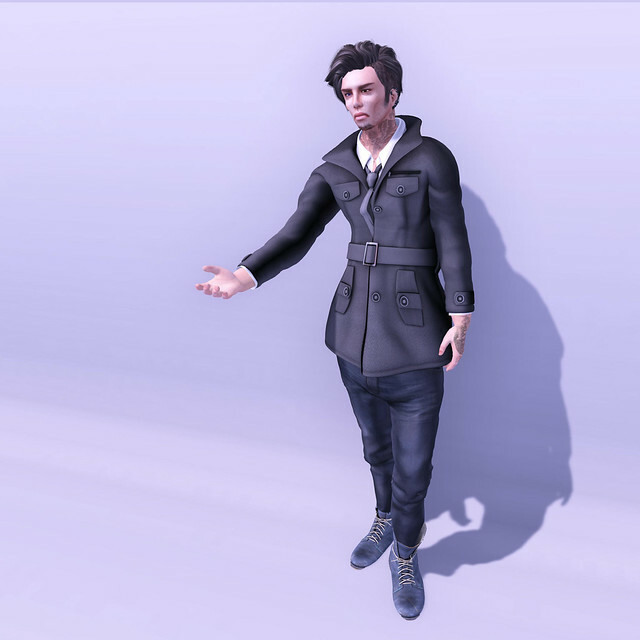 Jacket :: AITUI CLOTHING FACTORY – Layered Jacket NEW! @ The Mens Dept. Click here for style credits. This morning I suppose I was in a reflective mood. I logged in and took a stroll around the Glam Fair sim. It’s pretty cool. Each store houses a free gift disguised as a giant diamond. I have yet to go through and open everything, but who cares, it’s free! Keeping in stride with this lazy Sunday, I find myself just going with the breeze. Jumpin’ from club to club, doing a bit of shopping, blogging (obviously), perhaps chillin’ with that special someone. Who knows? I’m not worried, there’s no drama, no issues have fallen on my shoulders today and I don’t intend to go looking for any. Let’s all just have a Drama Free Zone sort of day, shall we? Shirt :: ::JLB::Apparel – Hooded Tee – Red NEW! Pants :: [R3] – Noah Jeans V2 NEW! Pose :: Unorthodox Animations – Faded 2 NEW!